An interesting case study in two ways to look at the world, collected on Reddit. 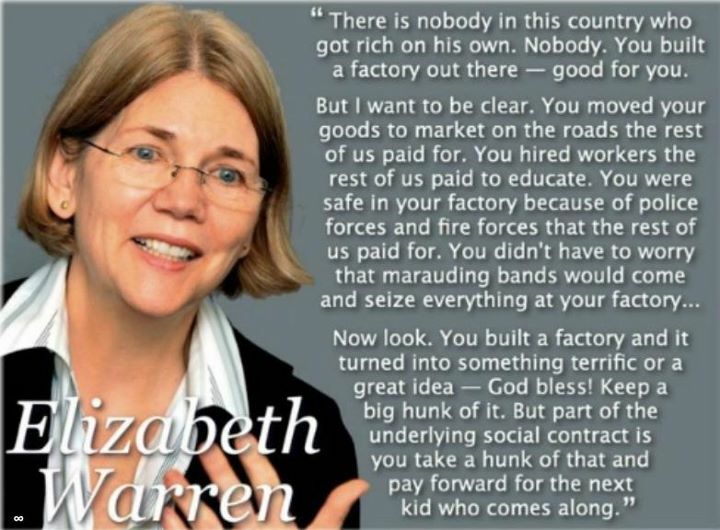 The first is an image that quotes Elizabeth Warren, the woman who essentially got the newly-formed Consumer Financial Protection Bureau up and running1, on the topic of paying taxes on your earnings because government programs significantly contributed to your success. 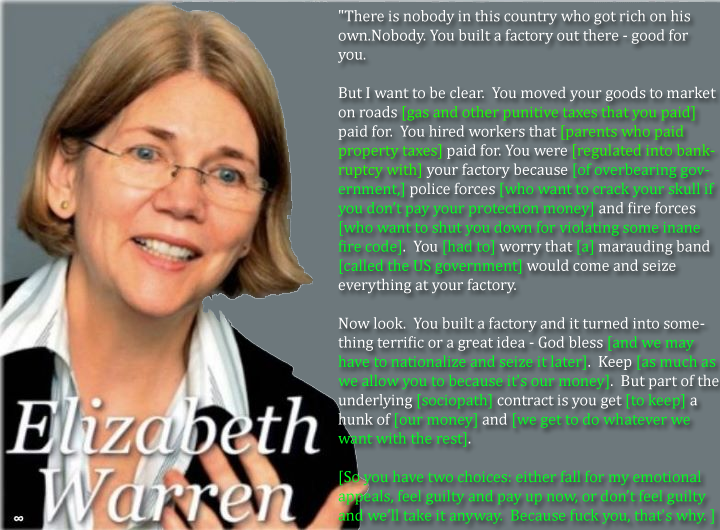 The second image is an incredibly cynical, borderline anarcho-capitalist and rather inflammatory indictment of everything that she says, boiling down to the twin facts that all those government programs were funded through people who benefited paying taxes and that the government views all income and industry as potentially belonging to them. There’s no doubt that the response is a pretty extreme rebuttal (characterizing the police as a protection racket that will do bad things to you if you don’t pay them their money), but at the same time, it’s pretty much the same thing Ayn Rand was saying half a century ago. And maybe it’s a sign of becoming one of the silent, jaded majority, but I can’t really find any flaw in the response’s reasoning. 1. Wikipedia also tells me that a week ago she announced her political candidacy against Scott Brown, the US Senator from Masschussets who succeeded the late Ted Kennedy. A more conspiratorial version of me might suggest that the original Reddit post was an attempt to begin drumming up support and goodwill for a heretofore obscure politician. Yes, it’s an attempt to drum up support for her. And I don’t think the response is all that cynical. Characterizing the police as a protection racket that will do bad things to you if you don’t pay them their money? Not exactly. You just have to pay the people they work for. Or a marauding band of cops will, in fact, come and seize everything at your factory. Don’t think so? Ask the CEO of Gibson Guitar. He didn’t donate to the Democratic Party, but his competitors at C.F. Martin did. Guess who got raided on trumped-up charges — twice — and who didn’t. In contrast, the founder and board members of Solyndra donated heavily to the Obama campaign, and they were rewarded with half a billion dollars of taxpayer money to spend on whatever they liked. After the money was all gone and the company was bankrupt, the FBI finally raided Solyndra — an empty gesture that accomplished nothing. Company executives have invoked the Fifth Amendment, and I expect they will all be allowed to walk. Move along, now, there’s nothing to see here. Paying taxes in exchange for government programs that significantly contribute to your success — yes, that’s a valid point. But Warren doesn’t actually acknowledge the tax part of that. She seems to be blissfully unaware that business owners are continually paying property taxes, licensing fees, sales taxes, payroll taxes, and so forth. No, she refers to those government programs as things “the rest of us paid for”, as if the entrepreneurs have been getting it all for free. That’s a ridiculous distortion of reality. Who is this “next kid who comes along” that she says successful business owners are obligated to “pay forward” a hunk of their wealth to? Why is he entitled to their money? And what is this “social contract” she’s blathering about? As others have pointed out, the social contract in this country is the U.S. Constitution, and it doesn’t say anything about this “pay it forward” nonsense. UPDATE: Wall Street Journal columnist James Taranto reports that the effort to promote Warren’s quote is the work of MoveOn.org. With the state of our economy, we do not have the luxury to make anyone feel unwelcome. We need those jobs. No, you political twit. This isn’t part of your duopolistic points-scoring on job plans and the economy. This about human rights. You might disagree whether or not there is an inherent right to be left alone to do what makes you happy, but don’t you dare try and cast a struggle for equality as some demented stimulus program. Currently, the only way to carry a handgun as a civilian in California, barring an unobtainable “may issue” concealed carry permit, is openly displayed on your person and unloaded. Everything else (carrying concealed without a permit, carrying a loaded handgun openly) is explicitly banned. Obviously, this corner case of the law is just absolutely nuts. Another instance of the idea that only cops should have guns. And, really, when would you ever need a gun in a Starbucks or McDonalds or IHOP? Whoops. Certain majors are not any less important because their books cost less, their jobs pay less or because they don’t have to write 20 page lab reports. English majors may not spend hours in a lab, but we can read a 200 page book in 3 hours max. Equality of all majors is based on the fact that the world cannot function without each one. Our engineers cannot be educated without teachers. Our country cannot run without political scientists or economists; and without meteorologists, we wouldn’t know that Hurricane Irene was heading our way. The thing I’m asking you to remember, fellow students, is the next time someone tells you about what you deem to be a “worthless” major, remember this article; remember that all majors are created equal. Damn. Apparently I’ve been reading books all these years without the proper qualifications. I guess I need to find an English major with reasonable rates to do the reading for me from now on. Apparently this author comes from a country without any economists, because an economist would point out that the intrinsic theory of value has been thoroughly discredited, and that a thing is worth what people will pay for it. Which means that all majors are decidedly NOT equal. This editorial is pure wishful thinking, and that’s not a coincidence. One of the reasons all majors are not equal is that in some majors, wishful thinking is an accepted practice; there are no objective realities, so everything is whatever you want it to be. English is obviously one of those. In some other majors, such as engineering, wishful thinking is completely ineffective and can even get you killed. But math is hard, and some people just can’t hack it. It would be mean to let them feel inferior as a result, so by all means, let’s tell all the people who flunked math that they’re just as good as the ones who passed! After they graduate, I’m sure that all of their potential employers will agree.